Very nice finca of 300m2 located very close to the beautiful small village of San Agustín on a plot of 7000m2, 4 Km from San José and 20 Km from Ibiza town. You will enjoy the charms of this small village typical of the island, while having the impression of living in the countryside. This house is a perfect place for nature lovers. Room, Ground level. This bedroom has 1 double bed. Bathroom ensuite. This bedroom includes also office area. Room, Ground level. This bedroom has 1 double bed King size. Bathroom ensuite. Room, Ground level. This bedroom has 1 double bed. Bathroom ensuite. 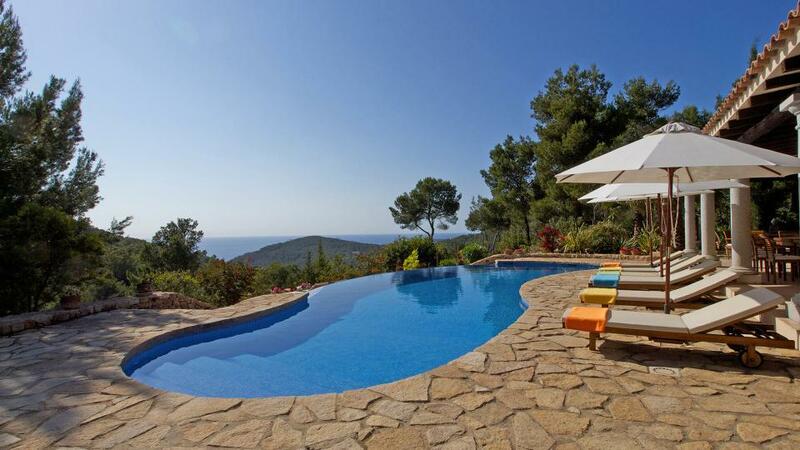 3 large terraces with sea views. Pantry with 2 fridges, washing machine, dishwasher and storage. Living room with television and fireplace. Relaxation area with sofa for 14 seats. Beautiful Mediterranean garden (citrus, almond and fig trees). Large teak table for outdoor dining (16 seats). Pool of 6m x 14m. All beaches on the West Coast are within a maximum radius of 10 km. Cala Tarida, where you will find our local offices, is located 5 minutes by car.